Banana Bread French Toast Breakfast Cups taste like banana bread and French toast got together and 1001decided to go all “Wonder Twin Powers Activate!” in the form of a breakfast cup. It has the golden brown, puffy, custard-like quality of French toast with a hint of distinctive banana bread flavour and spices baked into a perfect little individual serving. It’s built in portion control! Well, unless you’re my kids and you figure that anything left uneaten is a tragedy of epic proportions. 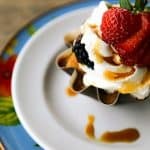 Around here, we love to serve them topped with whipped cream, some fresh berries, and a little drizzle of good, dark, Grade B maple syrup. I love how simple Banana Bread French Toast Breakfast Cups are to throw together, and with a little planning (i.e. spiriting them away before the kids noticed they didn’t eat them all), I can make enough in one shot to provide quick breakfasts for a few days. A delicious and nutritious breakfast isn’t just for school days, even though -and I am sorry in advance- it is getting to be time for many parts of the country to start getting ready for back-to-school planning. For this recipe, I usually purchase pre-sliced Italian bread from Wegman’s. 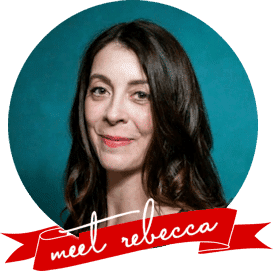 If your store doesn’t offer pre-sliced bread, or if you prefer to use homemade bread, make 1/2-inch thick slices of the bread before stacking, slicing into long strips, then slicing across those strips to create small cubes. Use very ripe bananas. The peels should have some black spots speckling the surface and be just about the same as you would use for banana bread. This is when they are at their sweetest. Simply peel the bananas and smash with a fork or potato masher until mostly smooth with no pieces larger than a pea. My preference is to sweeten these Banana Bread French Toast Breakfast Cups very slightly with real maple syrup. If you don’t have access to maple syrup, you can substitute an equal amount of brown sugar in the recipe. It will still be delicious. To store longer than 5 days, individually wrap the cooled Banana Bread French Toast Breakfast Cups and place on a sheet pan in the freezer. When they are solid, transfer to a large, labeled, zipper top freezer bag and store up to 3 months. To reheat, unwrap one Banana Bread French Toast Breakfast Cup at a time and place on a plate. Cover the plate with plastic wrap or a paper towel, leaving one corner well vented. Heat for 1 minute in the microwave. If additional heating is needed, heat in 15 second bursts until hot through and through. 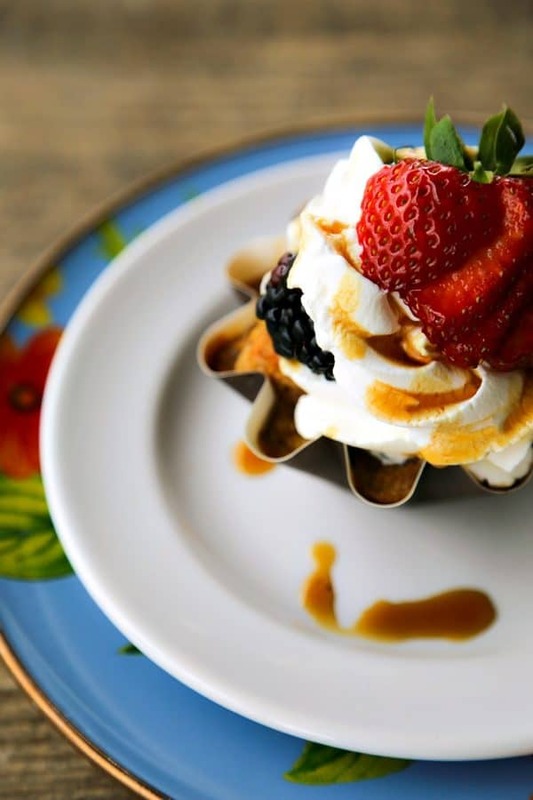 Garnish with whipped cream, berries, and a drizzle of maple syrup. Banana Bread French Toast Breakfast Cups combine the golden brown, puffy, custard-like quality of French toast with a hint of distinctive banana bread flavour and spices baked into perfect little individual servings. Preheat oven to 350F. Scatter the bread cubes in a single layer over a rimmed baking sheet. Bake for 8 to 10 minutes, shaking the pan back and forth every so often, or until the bread is dry to the touch on the outside. Take the pan from the oven and let cool for 5 minutes. Whisk together the smashed bananas, eggs, milk, maple syrup, cinnamon, nutmeg, and salt until even in colour. Toss in the bread cubes and let stand for 5 minutes. Generously spray a 12-cup, standard sized muffin tin with non-stick cooking spray. Use a couple of spoons to divide the bread cubes between the muffin cups. There will be liquid left in the mixing bowl. Divide that between the muffin cups, too. Bake for 25 to 35 minutes, or until the Banana Bread French Toast Breakfast Cups are puffy and golden brown on top. Remove from the oven and let stand for 3 minutes. Run a thin, flexible spatula or knife around the inside of the cups to help loosen them before easing them out. Serve hot or warm, garnished with fresh berries, whipped cream, and a drizzle of maple syrup if desired. These can be stored in an airtight container for up to 5 days in the refrigerator and reheated prior to serving. To store longer than 5 days, individually wrap the cooled Banana Bread French Toast Breakfast Cups and place on a sheet pan in the freezer. 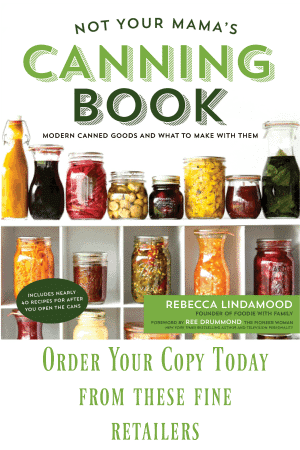 When they are solid, transfer to a large, labeled, zipper top freezer bag and store up to 3 months. 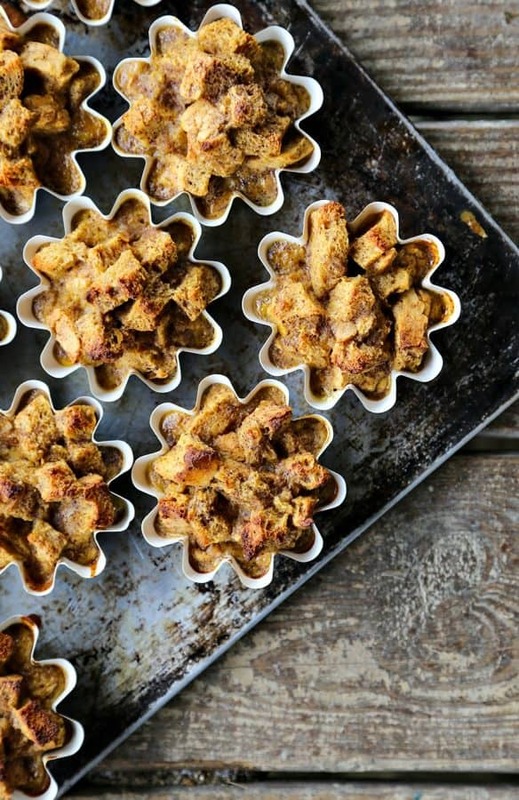 To reheat, unwrap one Banana Bread French Toast Breakfast Cups at a time and place on a plate. Cover the plate with plastic wrap or a paper towel, leaving one corner well vented. Heat for 1 minute in the microwave. If additional heating is needed, heat in 15 second bursts until hot through and through. 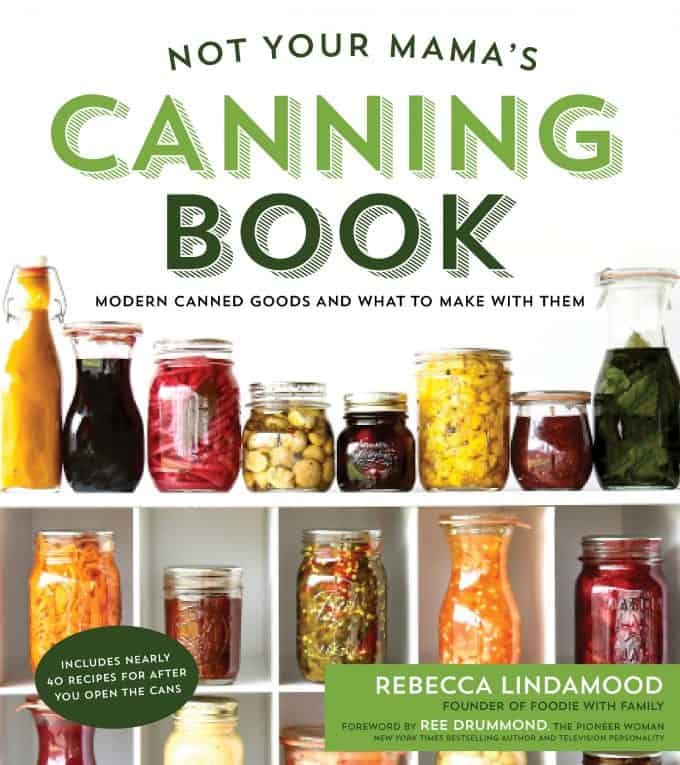 Not Your Mama’s Canning Book is available to order through these fine retailers! 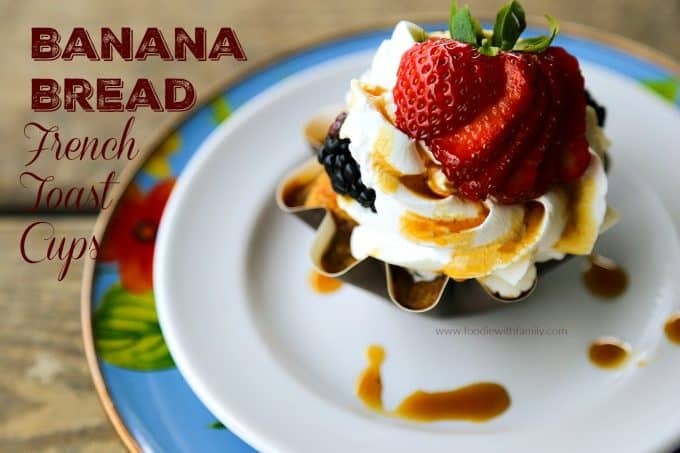 Banana bread is my favorite and these cups full of same taste and flavors looks totally amazing. I think my little one is going to be fan of this. Oooh! I sure hope so, Debbie! We love these! This is a great way to start the morning off! Oh hooray, Julie!! They’re really so very good. And I’m so glad I have a good reputation with your youth group!!! I love banana bread french toast. It’s look easy, delicious. I will definitely try this for my mother. Thanks for sharing. Keep sharing.